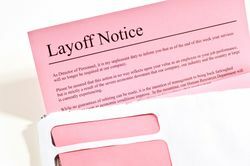 A layoff is a necessity for many struggling companies. It’s a reality that you have to accept when you’re told your services aren’t needed. Often a layoff does not reflect badly on your performance on the job. If that were so you would have been fired long before the company experienced any difficulties. If your gut feeling is that you’ll be facing unemployment, you should make some plans to meet the possibility. If you’ve been a good employee, the layoff may be temporary. By talking it out with your employer, you can get a good idea of whether you will be recalled and when you might expect to get back to work. Depending on the company’s economic circumstance, you may end up with a lengthy term of unemployment. The first step is to plan for a reasonable time frame. Depending on your financial status, you may give yourself a week or more when you expect to be jobless. There’s no need for panic, but you can take a wait and see attitude if you feel that you will be called back to work. Since there are no guarantees that a temporary layoff will become permanent, you should use your free time wisely to prepare a resume, ready to send out after your planned time frame for getting back to work expires. A layoff provides the opportunity to use your free time productively. You can look to improve your skills. During employment, you should have some idea of how you could increase your value to your employer. A layoff gives you that free time to hone your skills. Once you return to your old job, your new skills will make you a more valuable asset to the company and one the company won’t want to lay off in the future. Even if you don’t return to your former employer, your skills will be of interest to a new employer looking for someone with your skills. Just because you’re out of work doesn’t mean you should stop communicating with your previous fellow workers, boss and management. By showing them that you’re still interested in being employed with them, you have a far better chance of being called back to work. Offer up to work in a reduced capacity for your employer. There may be a job you still can do, though the salary might be less. You could act in an advisory role. Just because you’ve been laid off doesn’t mean you can’t volunteer to organise a company picnic. Showing you care, even though there is little compensation keeps you in mind in the eyes of the employer. This method may even open up the possibility of starting a business of your own. Many laid off workers have been successful filling a need for their former employers. Staying positive when things look bleak is hard to do, but it is those who don’t give up who don’t stay unemployed for long. If you must look for new employment, you’ll need to project confidence in every interview you do. If a job isn’t immediately visible on the horizon, you could use the time to change dietary habits or get into an exercise routine you’ve been promising to do while employed. If worse comes to worse and your industry isn’t about to recover anytime soon, consider a major career change. Going back to school may be your best investment. Many people don’t like their job but feel tied down by bills and the demands of their work. Thinking about what career you’d like to get into well before you get laid off is the best policy as you have the chance to salt away money for your new education. A layoff doesn’t have to be something to dread. It’s not a reflection on your character. If you look at a layoff as an opportunity, you will find better employment a lot quicker or a better job once your employer hires you back.